Napa know-how: Early in his career, chef Wes Morton did a stint at Thomas Keller’s famed The French Laundry. 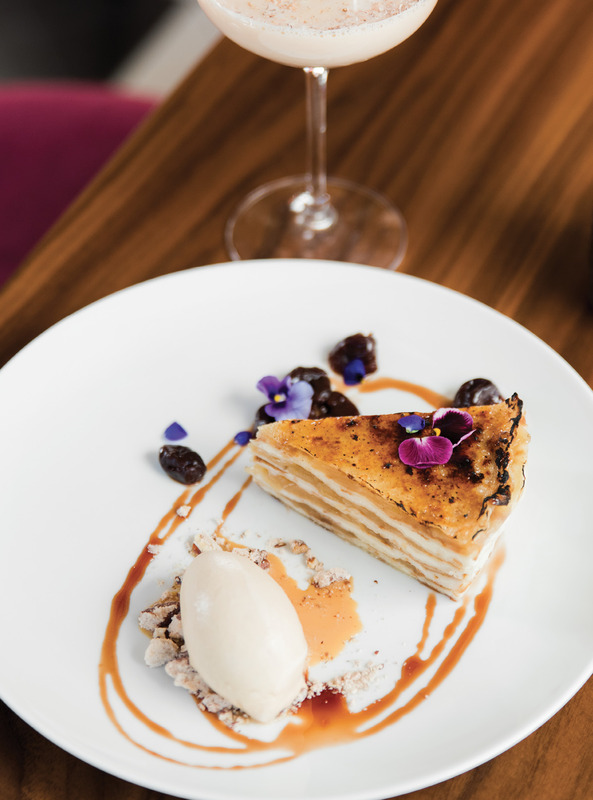 Layered beauty: Pastry chef Jenn McCoy’s flower-adorned apple crêpe cake pairs well with bar manager Ryan Casey’s White Elephant cocktail. 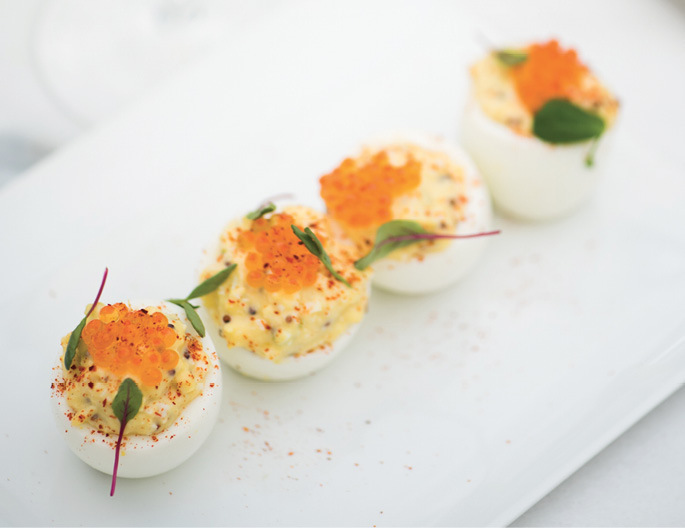 Eggs on eggs: Trout roe sits atop tangy deviled eggs, offered on both the lunch and dinner menus. Dressed for Dinner: As the afternoon fades to evening, the atmosphere shifts from casual eatery to fine dining. In the thick of World War II, young female journalist Inga Arvad was assigned by The Washington-Times Herald to profile an even younger Naval Intelligence officer, John F. Kennedy. Sparks flew. Yet their ensuing romance made a lot of people nervous; given that Arvad had been photographed with Adolph Hitler, she was on the FBI watch list as a potential German spy. Neither J. Edgar Hoover nor “Papa Joe” Kennedy wanted JFK whispering sweet nothings into the wrong ears, so he was transferred to a desk job in Charleston. Arvad followed for weekend rendezvous in local hotels—tailed by the FBI, the U.S. Navy, and her soon-to-be-ex-husband. We can only imagine what it was like to be the FBI fly on those hotel walls; ultimately, the romance and spy theories dissipated. What lingered for Kennedy was an affection for his time spent in the Holy City, lit by love—and by rambunctious cocktail parties on Murray Boulevard. Two decades later, President Kennedy commissioned a federal building to tower above Marion Square. The L. Mendel Rivers Federal Building operated for 35 years until Hurricane Floyd hit, causing so much water damage that it remained vacant for the next 17. Enter hotelier John Dewberry, who gutted the interiors and brought the now sparkling brick-and-marble structure back to life. Newly transformed by a translucent slip of locally mixed lime wash, it has been reborn as The Dewberry, a swank and stylish hotel Kennedy surely would have adored. The Dewberry’s fine-dining venue, Henrietta’s, juts off from the marble lobby. 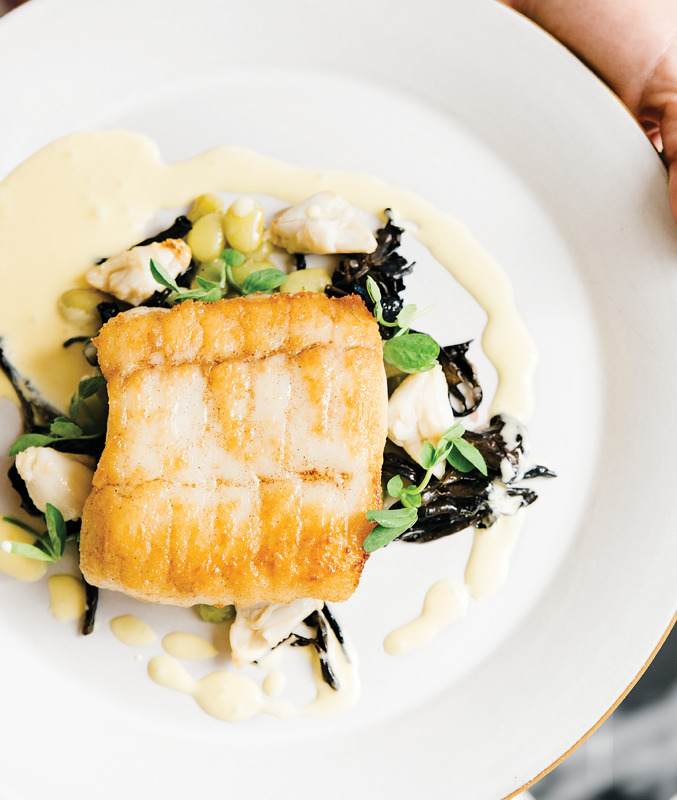 Rather than take cues from the mid-century modern building itself, Henrietta’s feels more like a 1920s upscale Parisian haunt of Hemingway’s, though with a contemporary, minimalist aesthetic. There’s something about the high wicker-paneled ceilings, slowly turning fans, black-and-white checkered tile flooring, potted palms, darkly paneled bar, and lacquered brass accents that make diners feel like globe-trotting expats. Enter by morning, and you’ll find the bar lined with a medley of pastries and other delicacies as a white tuxedo-jacketed server pops open a bottle of bubbly destined for mimosas. 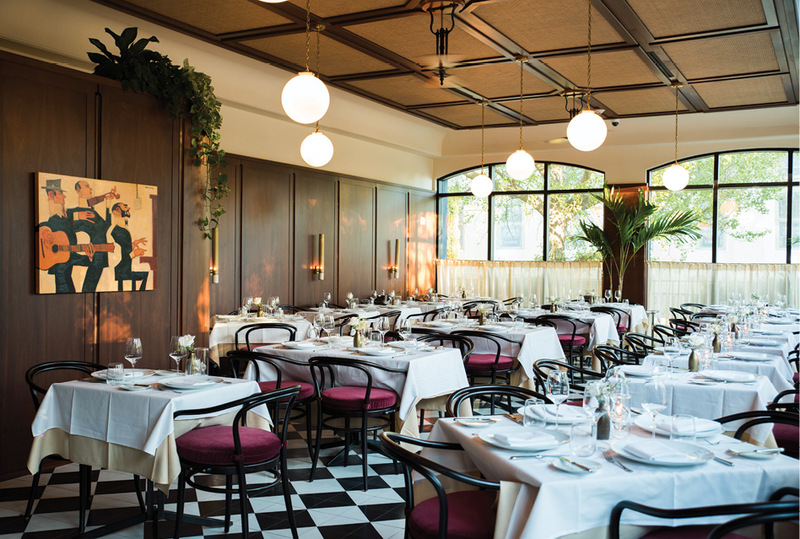 Lunchtime finds the brasserie bathed with indirect sunlight, as diners fork into triple-fold, glistening omelettes or frisée salads topped with sliced duck confit. By night, bistro tables glow with white tablecloths and flickering votive candles. The brasserie aims to please around the clock. Much of what’s particularly pleasing comes from the food itself. 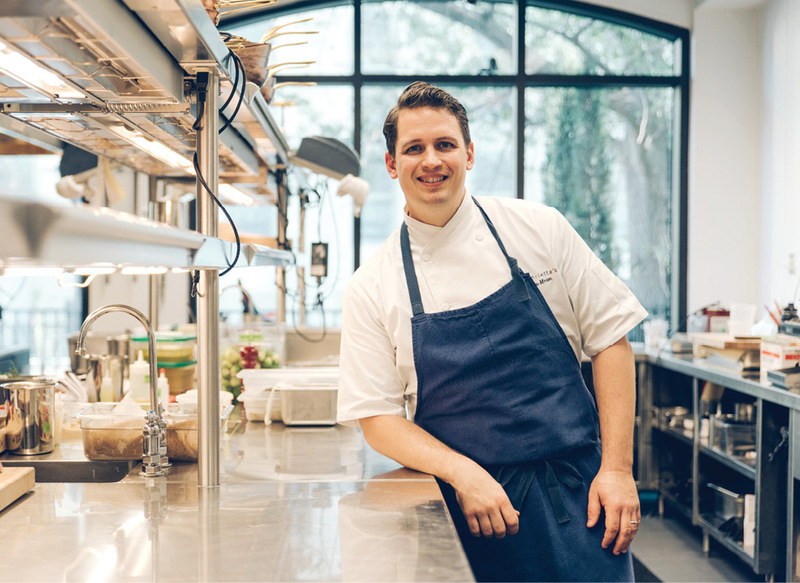 Classically trained, Louisiana-bred executive chef Wes Morton truly shines through the French staples on the menu. His country-style pâté appetizer, served with house-pickled haricot verts, chive-sprinkled whole-grain mustard, and grilled bread, is enough to teleport Francophiles to their favorite cobblestone village across the Atlantic. Ditto for the grenobloise sauce that graces lunch and dinner catches. Mine was flounder, yours might be trigger or wreckfish, but rest assured, the meat will be moist and flaky, the sauce a lemony velvet with fried capers for salty crunch, and there will be little turrets of swirled, browned potato puffs resembling Hershey’s kisses. Take care to include fresh slivers of lemon and flat-leaf parsley in each bite, and you will not be disappointed. Other staples, too, carry over from lunch to dinner, including deviled egg cups garnished with bright orange trout roe and the creatively served gougère appetizer—airy, cheesy pastry balls flavored with thyme and sprinkled with benne seeds (a nod to local history). The four puffs nestle snugly in a ceramic pot enclosed with a removable slate lid upon which a potent smear of chicken liver mousse sits. It’s a clever presentation—and tasty. Count on lunch’s juicy, fatty burger smothered with aged Swiss Emmental and topped with onions slow-simmered in a bordelaise reduction. The evening menu includes lunchtime’s rustic hanger-cut steak frites, for which the sauce has evolved a few times since the restaurant’s summer opening, a recent incarnation hinting at cognac and peppercorns. Both the burger and steak come with addictively salty skin-on pencil fries (perhaps too salty alone, but great when paired with meat), plus plenty of fine Burgundy and Bordeaux options to wash it all down. Subtle daily menu tweaks keep diners’ palates entertained and kitchen staff on their toes. Novelty might take the form of a squid-tentacle-centric riff on a classic Niçoise, or the kitchen’s daily interpretation of fluffy gnocchi (mine dripped with browned butter, lightly pickled turnips, and braised radishes), or paper-thin toasted chickpea “socca” crêpes layered with a musky Loire Valley goat cheese, piled high with shaved squash and pine nuts. Prices might raise some eyebrows, but apart from the occasional hit-or-miss dish, the dining experience merits the expenditure. If I had to name a weakness, I would point to overly restrained seasoning in certain items, such as my lackluster lump crab rémoulade. And if you are planning to dine and dash to a show at the nearby Gaillard Center or Charleston Music Hall, be sure to specify your need for speed. My evening meal kept a languid pace, with long gaps between courses even though the restaurant was not full. Not that I minded, given good company, well-balanced craft cocktails (I recommend the One Before Supper, Brandy Crusta, and High Ball), and the muted trumpets of a Brazilian samba soundtrack. But if I were JFK, lounging with my paramour in a room above, phoning down (as the FBI listens in) to order up some chocolate cookies and milk, I would be warned that it does take 15 minutes for those treats to bake to order. Opt instead for one of pastry chef Jenn McCoy’s house-made ice creams or mille-feuille confections, and you’ll be in a sweet spot indeed. The Drawback: Service can be slow, so don’t expect a hurried meal.